I decided to keep it simple – cause summer food is simple! You don’t want to be slaving over a hot stove when you could be sipping a cool glass of white wine (or in my case English Cider). It took me 30 minutes to make from start to finish, and won major brownie points with the fiancé. Perfect! 1 Tomato and Red Pepper salad as an optional side. mix the red wine, balsamic vinegar and garlic together. Add the steaks, and leave to marinade. (I left mine for 5 minutes). 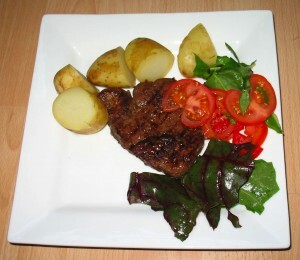 While the steak is marinading, boil your potatoes, slicing the bigger potatoes into halves or quarters, for 20 minutes. You know they’re done when you can cut the biggest in half, and cut a small sliver from it. If it is easy to cut, and it tastes good then they are done. Both of us like our steaks medium to well-done, if you like your steak differently adjust the cooking times. Put each of your steaks in a hot grill pan, quickly sear both sides and then turn down to a medium heat. Cook for 5 minutes each side. When your potatoes are done add them to a bowl of cold water to cool them down. I think cold potatoes are much more summery than warm. Remove the steaks from the grill, and the potatoes from the cold water and serve. Best served with a tomato and pepper salad.